More than 70 years ago two Lancaster men embarked on an amazing 5,000-mile flight in a Sunderland Flying Boat, their adventures coming straight out of the pages of a Jules Verne extravaganza. This photograph was taken in 1949 and shows the Lansil employees who had served the company faithfully for 21 years from 1928 with Lt. Col. Sir Norman Seddon-Brown seated centre of the front row. This account was taken entirely from letters sent home by Mr James Geoffrey Seddon-Brown recounting his experiences on an incident-packed journey to India which saw him flying over the D-Day landing beaches in Normandy, over the pyramids of Egypt and through a violent electric storm. He was representing the Lancaster company of Lansil, headed by his father Sir Norman Seddon-Brown. 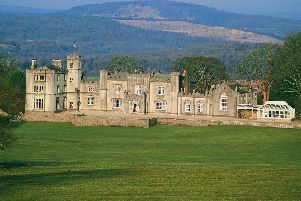 The family had moved to Escowbeck, Caton in 1938 from Bank Hall, Bretherton, Lancashire. James lived at Tarn Beck, Brookhouse, which was only a few miles from his parents’ home in Caton. The incredible journey was undertaken towards the end of 1946 when Mr Seddon-Brown, accompanied by Mr Frank Merckel, Lansil’s spinning manager went to Hyderabad, in India, in connection with the company’s project for the installation of a cellulose acetate and weaving plant at Sirpur in Hyderabad State. At the same time, Mr Seddon-Brown was required to make a survey of all the main Indian markets, which was also mainly made by air. We take up the story, in James Seddon-Brown’s own words, when he and Frank Merckel boarded the Sunderland flying boat in Poole Harbour. “We were taken aboard in a fast, comfortable launch and were amazed at the spaciousness of the Sunderland; with her two decks, and four huge engines she looked indeed every inch a fine ship. “Inside, the accommodation was divided into four main passenger cabins, which were comfortably fitted out with lounge chairs and tables. “Our berths were in the tail cabin, which according to the steward was the warmest and pleasantest on the ship. “Leaving Poole was just like taking a leisurely taxi ride; one spurt and the ship was airborne almost before we knew it and we were admiring the Bournemouth coast line and the blue of the sea at a considerable height before many passengers realised that we had left the harbour. “Within a very few minutes, it seemed, we were over the D-Day beaches of Normandy, and the deep pits made by the bombing of our invasion forces were still clearly visible. “Wrecked villages and the remains of two Mulberry harbours flipped past us as an excellent lunch was served by the two stewards from a beautiful, modern and electrically equipped galley. “All went well until we were deep in French territory and approaching the snow-clad Central Massif. This large group of mountains looked very gloomy and forbidding, and there seemed to be very heavy snow right down into the valleys. “The ship began to lose height very rapidly and our ears hurt unbearably for a time due to the swift change. Then we ran into a series of air pockets and nearly everyone on board began to feel sick. “A lady from the cabin in front brought in her small girl of six to our cabin as she had been told by the steward that it would be warmer. No sooner had they arrived than they were both extremely ill.
“We felt sorry for the little girl, but it was all we could do to maintain our own dignity and pretend that we did not feel very airsick. The rest of the journey over the Massif was just too unpleasant to be real and seems now like a particularly nasty dream. After what seemed an age, we were told that we were approaching Marseilles. “Dusk was drawing in and an 80 miles per hour gale was blowing. “The pilot was not at all sure that he could make the landing at Marseilles and there was a meeting, according to the stewards, to see whether we ought not to be taken back to Bordeaux. “Finally, however, the pilot decided that he would risk a landing in spite of the gale and went down over the aerodrome. He just skimmed the concrete apron and finally put us down with a tremendous slap in enormous waves which washed right over the ship’s wings. “We were all very relieved to sit quietly and drift with the waves into the harbour. “After a rather shaky disembarkation we set foot on the Marseilles aerodrome and were taken in buses to the hotel Noailles in the centre of Marseilles city. “The hotel, full of excited Frenchmen, was excellent. After a good dinner and half a bottle of French wine we felt well enough to go and see a French farce in the theatre opposite. Next day we rose reluctantly at 5am and everyone hoped that the Mistral, which is the local name for the high wind which had given us so much trouble the evening before, had moderated to enable us to take off. “We were not looking forward to that part of it, although they told us that once we got off, the wind was a favourable one and would cut our flying time down considerably on the next lap. “So far, the journey had been anything but enjoyable, but, of course, it was only the start. After a breakfast consisting of a cup of weak ‘Tannic Acid’ which the French, in their more facetious moments call ‘The a l’Anglais’, and a rather hard roll, we were packed into an enormous bus. “A rugged individual, who had some obvious connection with Morocco in his make-up, proceeded to propel us at a tremendous rate, in complete darkness, down a series of narrow, twisting roads, along the side of a cliff; even the French passengers considered the speed ‘fantastique’. “On two or three occasions headlights were switched on to alleviate the total darkness, only and presumably, to avoid a collision and complete disaster. “After 30 minutes of this sort of thing we became almost indifferent and staggered out on to the aerodrome rather worse for wear, but relieved to think that nothing much worse could happen to us in the air than we had just undergone. “To our surprise the airport authorities had prepared a very excellent English breakfast for us prior to leaving, and they made a great fuss of us. The gale was still blowing hard and I made a mental reservation that we should certainly not be able to take off for the next 24 hours. However, after an hour, we did take off. “The skipper announced that he was going to taxi across the harbour to what he hoped would be smoother water on the other side and before we knew it and had time to get properly frightened, we were in the air. “The ship climbed fast to nearly 12,000 feet and we came out into the first brilliant sunshine we had seen. Corsica and Sardinia soon made their appearance and looked very beautiful in their aquamarine setting. “Corsica is very rugged and the white rock, dotted with scrub and pine forest, was very much like the Alps Maritime. There were four of us in our cabin, an airline officer’s wife going out to join her husband, an English foreman engineer, going to Singapore, Merckel and myself. “Both the woman and the engineer were not too well and were hastily given pills by the head steward, for which Merckel and I thanked our stars. “The small girl of six and her brother came in and announced that they felt very ill. I am afraid we suggested that they should return to be near their mother in her cabin. They did not look as if they would make it in one piece. The day before, we had a level white blanket of cloud below us stretching smoothly and unbrokenly-today, however, the strata had broken, and the blue of the Mediterranean was delightful to look at after an English November and so much rain. “We were running along the south coast of Sicily and the grey-green hills wove slowly past with creamy coloured hill towns and an occasional military camp-abandoned. There seemed to be more brown than green, but that was probably due to the time of year. “At 12 o’clock there was some excitement when we sighted Mount Etna, the majestic volcano, with its enormous cap of snow and its plumes of smoke or mist. “Then we came down gracefully to a perfect and effortless landing at Augusta. There followed a hurried lunch in an Italian restaurant with a bottle of local wine at 3/- a bottle, which tasted mainly of turpentine and cloves. “All the passengers were very excited at the prospect of purchasing real silk and nylon stockings at £1 a pair at the local shops. “Unfortunately, by the time we had found out ‘the drill’ and located the shops it was too late to do any buying and we were hurried into the launch through a lovely garden of palms and bougainvillaea in full bloom. “We registered the silent hope that we should call there on the way back and agreed that we should definitely go into the town first, sacrificing lunch, if necessary. “The launch took us out from a small wooden jetty, skirting several wrecks of the landings in the last war and we got off to a smooth start for our run to Cairo. “The water rushed past our cabin giving a tremendous impression of speed; the ship trembled and shuddered slightly, but if it is calm, you can be in the air after 45 seconds. “Just before the ship comes ‘unstuck’ is the moment; the pilot accelerates to the full extent of his engines and with a last rush the ship seems to tear itself off the surface of the water as one would tear off an Elastoplast. “The navigator came down later to tell us about the progress made and explain the ship’s position. “He informed us that we were running into two cold fronts and that we had been blown off course to the south, so much so that they had been forced to pick up the North African coast at Mersa Matru and follow it, rather than rely on navigation. “The last two hours in the dark were most unpleasant. A violent electric storm appeared to be in progress and the lightning flashes would have frightened and upset the most collected individual. Our cabin became oppressive, in spite of the excellent air conditioning. “We climbed to 12,500 feet without oxygen, which added to our discomfort; there seemed to be something malignant in the storm, which had descended upon us. “It is difficult to describe one’s sensations as one hurtled along, the plane quivering and rocking, all view obscured by cloud and darkness. “The sensation of heat, bursting heads due to the height, and general fear of the unknown crowded in on us. The journey seemed to be something which we should have avoided at all costs and I felt myself wishing many times that I had been on the deck of a ship, where, at least, there would have been something solid underfoot. “To everyone’s relief we left the cold fronts (as the pilot called the storms) at about 8.30pm and there in a blaze of lights lay Alexandria, under a brilliant moon. “It seemed strange to see the road and the sandy fringe of shore along which the Germans came so close to the Suez Canal during the war. Then we became aware of a tremendous sensation of space given by the desert and the flat gardens of the delta. Finally, another blaze of lights - Cairo. “The skipper circled to let us see the city and in the darkness of the night we came in to a perfect landing on the river Nile. *Next week in the second part of the journey, J G Seddon Brown continues his travels through Cairo and onto Arabia and finally India.